Posen's Jared Sharpe reaches 1,000 point milestone. Hale, Mich. — The Posen Vikings entered the game in Hale Tuesday night not only hoping to win in order to have a chance at earning a share of the North Star League-Big Dipper title, but also looked to have senior Jared Sharpe reach 1,000 career points. He needed 18. Sharpe struggled offensively off the top, knocking down six free throws. 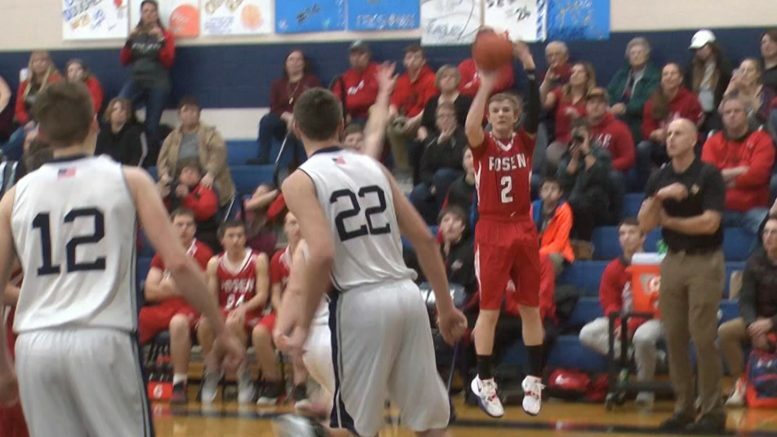 He finally made a 3-pointer in the third, which sparked some life for a Posen comeback. Then with less than six minutes left in the fourth, Sharpe made three more 3-pointers, reaching 1,000. His teammates and Head Coach Chris Keller surrounded him as fans and family roared with pride. Hale would end up winning the game 70-56. Sharpe became the 11th boys athlete from Posen to reach the milestone. The last being his brother Travis Sharpe in 2016. His cousin Thomas Wozniak also reached 1,000 in 2001.